You are here: Home / Kids Wellness / What Are The Symptoms Of Vitamin D Deficiency In Babies? We can't stress enough on the importance of Vitamin D. Children and adults alike, need Vitamin D for a variety of reasons. Vitamin D plays a crucial role in the development and growth of bone structures. Vitamin D helps the body absorb calcium and develop strong teeth and bones. Additionally, reliable reports also state that Vitamin D helps fight diseases; it reduces your risk of multiple sclerosis and decreases your chances of developing heart disease. Studies also report that Vitamin D is essential for fighting the flu. There´s no denying the obvious benefits and importance of Vitamin D. Hence, children in their first year of life must receive a minimum of 400 IUs of Vitamin D per day. Unfortunately, breast milk alone, doesn't provide an adequate amount of Vitamin D. Therefore, as a parent, you must use other methods to ensure that your child receives Vitamin D.
You should also ensure that your child receives sunlight on his/her skin; the sunlight helps his/her body make Vitamin D.
Your child gets about 80% of his/her Vitamin D this way. So, what is the recommended intake of Vitamin D for your children? Well, an infant, up to 12 months of age, needs 10 Mcg of Vitamin D on a daily basis. And, children older than 1 year need 15 Mcg of Vitamin D.
Of course, as your child grows older, it will become easier to feed him/her foods that are rich in Vitamin D. Some of the foods that naturally contain Vitamin D include food such as salmon, mackerel, sardines, and herring, liver, mushrooms, and egg yolks. There are foods that also have Vitamin D incorporated to them and they are low-fat dairy products, cereals, and margarine etc. All infant formula contain Vitamin D.
Children who are at the most risk of Vitamin D deficiency? What happens when babies don't get enough Vitamin D? One of the most severe symptoms of a Vitamin D deficiency in children is undoubtedly rickets. Rickets is a medical condition that causes soft and fragile bones. The condition is more common in children with darker skin. Rickets may cause a kid's scalp to feel soft to the touch. And, the poor or incomplete scalp formation can increase an infant´s risk of sustaining injuries to the head. Children with rickets can also develop unusual bone deformities; rickets can cause a child´s legs to be unusually bowed outwards or cause his/her spine to be crooked and misaligned. Rickets in infants can be really dangerous. If your infant does not receive the adequate dosage of Vitamin D, his/her teething schedule can be largely affected. A deficiency can result in a delayed development of the teeth. As we stated earlier, Vitamin D is essential for the development and growth of bone structures. Hence, if your child doesn't receive enough Vitamin D, it is likely that the growth of her bones will be impacted. If you don´t want your child to experience severely stunted growth, you should ensure that he/she gets an adequate amount of Vitamin D.
Of course, it is completely normal and common for babies to suffer from cold and flu during the winter months. But, with a deficiency of Vitamin D, they will be prone to suffering from those conditions for a longer period. A lack of Vitamin D can also put your child at risk for serious respiratory problems. 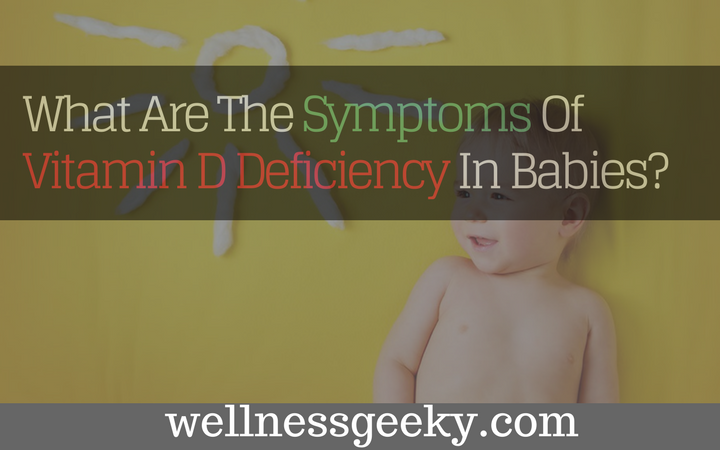 If you are unable to identify what is causing your baby to be fussy and irritated, a deficiency of Vitamin D could be part of the problem. Irritability is one of the less obvious symptoms that are associated with a lack of Vitamin D, but it is a symptom nonetheless. The bone pain symptoms may cause the infant to become frequently fussy or irritable. Children who don’t expose their skin to sunlight are heavily at risk of suffering from symptoms caused by the deficiency of Vitamin D.
Children might also be at risk of deficiency if they have been breastfed for a lengthy period and have a mother whose Vitamin D level is low. Children who suffer from conditions that affect how the body controls Vitamin D levels can also be exposed to plenty of risks. If you are not certain that your child is receiving an adequate dose of Vitamin D, you should get him/her checked immediately. Treatment is usually done as per the requirement. Depending on your child´s situation, the doctor may recommend a High dose Vitamin D therapy. Also popularly known as Stoss Therapy, the high dose Vitamin D therapy helps in preventing bone problems. The treatment for Vitamin D can be either done orally or through an intro-muscular process. Injected Vitamin D usually lasts for around 6 months and it is especially effective for children who hate consuming oral medicine. It is also possible for the doctor to recommend a calcium and phosphorus supplement. You must follow the treatment guidelines properly to reverse Vitamin D deficiency.